A block of flats in Galashiels has been torn down in order to make way for the reopening of the Borders to Edinburgh railway. The properties at Beechbank Place had been earmarked for demolition for some time. 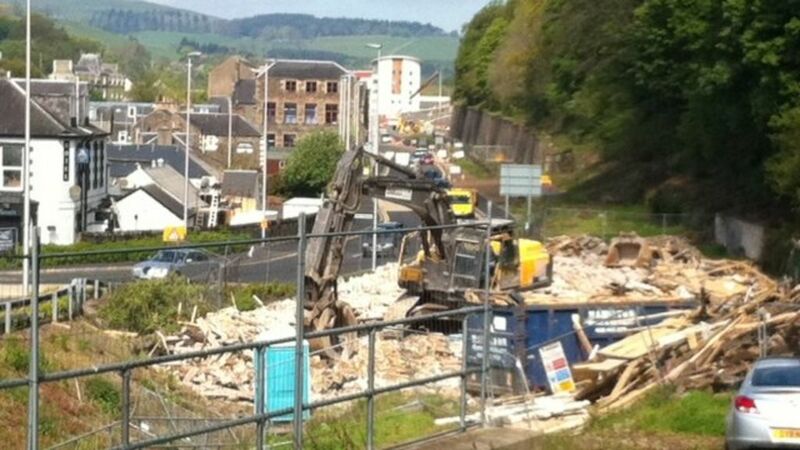 A block of flats in Galashiels is torn down in order to make way for the reopening of the Borders to Edinburgh railway. View from the new road bridge over Station Brae on 6 February 2008. Beyond the bridge is a block of flats converted from an old mill which stood adjacent to the railway prior to closure. It will need to be demolished to make way for the new route, which is having to be realigned to avoid the recently built supermarket behind the camera. The trackbed continues northwest as a walkway alongside the A7 in the middle distance, passing the site of the proposed new station.